​In Enablement Mastery, author Elay Cohen gives you his proven, straightforward, and effective method for aligning people, processes, and priorities with relevant learning, coaching, and communications. This book will show you how to build organizational value and multiply revenue outcomes by enabling your employees and partners to be the best they can be. Geared toward enablement professionals, this book teaches leadership teams how to deploy the Enablement Process Map to align go-to-market teams, create a learning culture, and make communications relevant. Cohen will help you elevate customer engagement and achieve hyper-growth business outcomes. 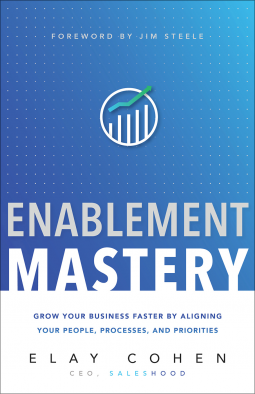 “Elay Cohen is a legend in the sales enablement industry, and I wholeheartedly endorse Enablement Mastery. Anyone starting, or looking to improve, their sales learning function needs to read this book first." “With Enablement Mastery, Elay Choen enabled us with a masterpiece on sales enablement! A captivating roadmap to help shape your vision for sales enablement, this book also helps you blend the right enablement culture, organizational design, and process for a successful go-to-market strategy. A must-read for any leaders in sales, marketing, and learning and development roles in modern organizations."